This BEST ever Sour Cream Banana Bread recipe is delicious enough to put on your Banana Bread Giving List, but to also enjoy a loaf yourself. It’s truly the best ever recipe, so moist and delicious. Watch the video! Is there anything better than the smell of homemade bread baking in the oven? Sour Cream Banana Bread at its best? What is the best banana bread recipe? I say the best banana bread recipe uses very ripe bananas. Use overripe bananas on the counter to bake this classic banana bread recipe, which gives the best “banana” flavor! That, and not over baking the bread, is the best banana bread. The kitchen is quiet as I pull from the oven several loaves of the BEST Sour Cream Banana Bread recipe! Dinner dishes are done, everyone is scattered, the hum of the oven fan is buzzing in the background, the house smells so lovely. Now, sitting quietly on my kitchen stool, I discover there are a few thoughts that come to mind when it comes to banana bread. 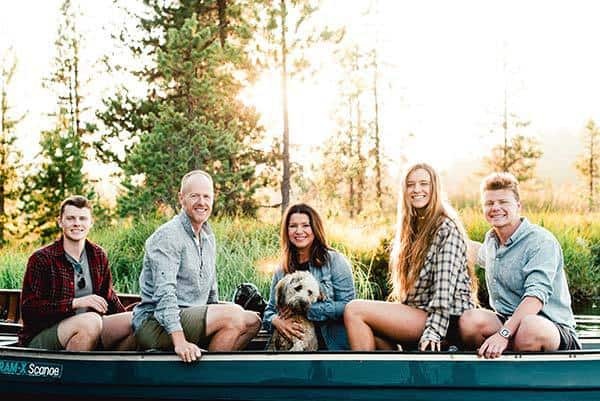 Life has moved toward tender and lovely, as our family has changed and the kids have grown. We love to add sour cream. Do not overbake the banana bread. Do you have to put banana bread in fridge? Nope, no need to refrigerate the Banana Bread, but it’s best if you you can keep it in an airtight container in a cool place. We also wrap the bread in plastic wrap, then a layer of foil, and we freeze the bread. Feeling the moment, open to what life hands me, feeling my feelings (even the painful ones), sensing the changes ahead in our life, doing new things, meeting new people, opening our lives to new people, sometimes moving on from past relationships—nothing seems to stay the same. But there is one thing that hasn’t changed over the years. BEST and beloved bread in our home over the years, I’d have to say, is banana bread. 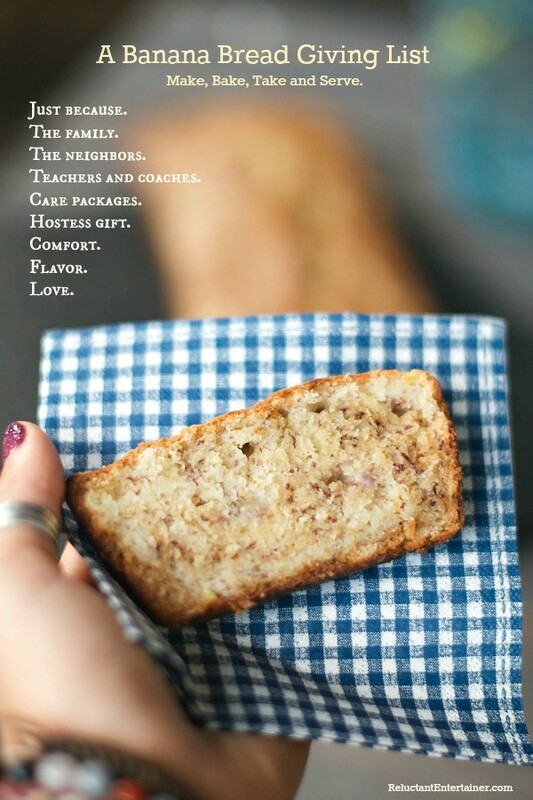 So much, that I’ve made a Banana Bread Giving List. I love to make this recipe in my favorite ceramic loaf pan. I slice it warm with this serrated knife and add a hunk of butter. 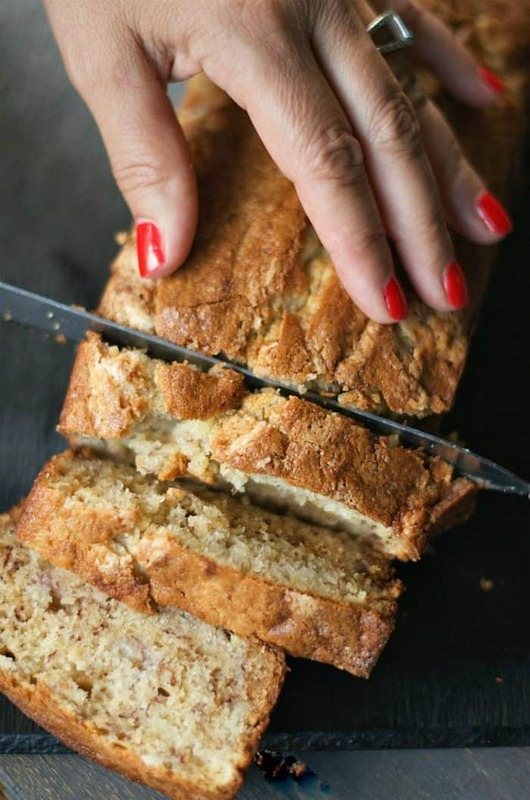 How to bake banana bread to perfection really depends on the size of your pan. You can bake this recipe in 1 loaf (which will take longer) or smaller loaves (which take less time). Always check the bread in the middle with a toothpick to see if the loaf is done baking, before removing from the oven. If the batter sticks to the toothpick, bake a little longer. 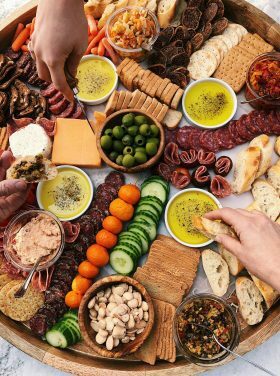 Everyone loves it — perfect for a snack, to give away to a friend, neighbor, or teacher, to send in a care package, whip out of the freezer and serve for out-of-town guests at breakfast. The banana bread list goes on and on. Add in sour cream? It’s even moister, more flavorful, and delicious! You can even substitute the sour cream with Greek yogurt. So moist and sweet, this yummy recipe goes hand in hand with memories of years past. Pulling the same loaves from the oven, little kids underfoot. Activity and lots of chitter-chatter, chins up against the countertop just waiting for that first bite. 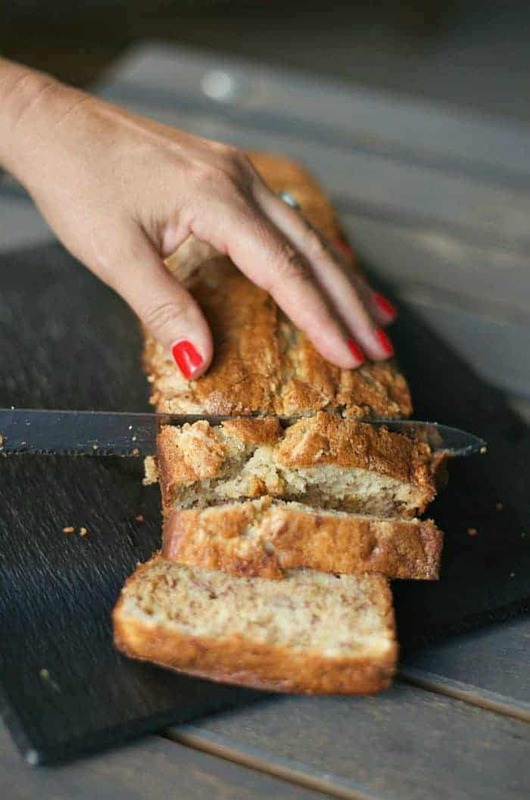 Who’s on your banana bread giving list? 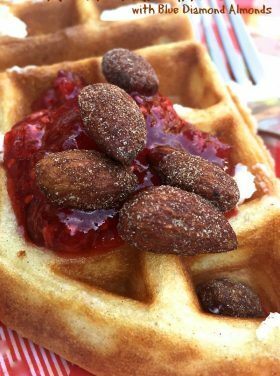 I am a huge fan of my KitchenAid mixer and hand-mixer for these types of recipes! 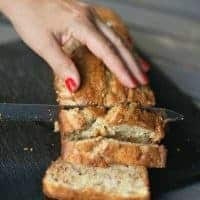 BEST ever Sour Cream Banana Bread recipe, so moist and delicious; you can substitute the sour cream with Greek yogurt. Preheat oven to 350 degrees. Grease and flour one 9-inch loaf pan (or 3 small ones). Pan should be 3/4 full of batter. In a large bowl, cream the butter with sugar until light and fluffy. Add the eggs and mix well. Whisk together the flour, baking soda, and salt; combine with the butter mixture. Add the sour cream, bananas, and vanilla; stir well. Pour into prepared pans and bake for 50-55 minutes. Cool for 10 minutes and then turn the loaf out onto a rack. This post has affiliate links. Every purchase from these links supports RE at no extra cost to you. Thank you! This post is reposted from 2015. I’m making this recipe now; got some very ripe bananas begging to jump into the pan! I don’t think this will help me right now but, I want to make these with cupcake papers and have them as separate “Muffins;” I’m questioning moist batter….17-20 minutes ? Or, will I end up with centers not done? I made this today and it was DELICIOUS! It only last about an hour before it was all gone! 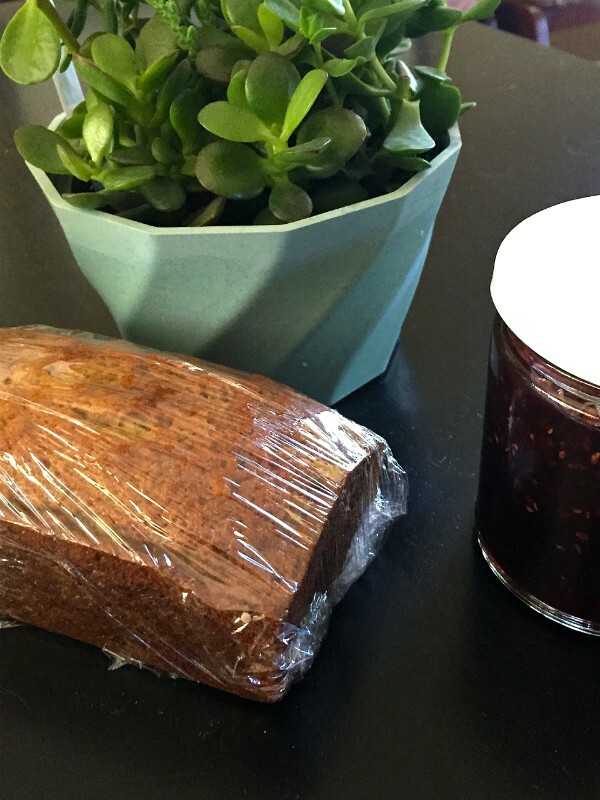 I’ve never had such moist banana bread, and I love that it wasn’t “too sweet”. Will definitely be making it again – thanks! This is the best banana bread recipe I’ve tried. It doesn’t rise a lot in our altitude, but it is so moist. I always get compliments on it when I bring it to work. How could I alter this for high altitude baking? Has anyone tried it yet that could give me some advice? 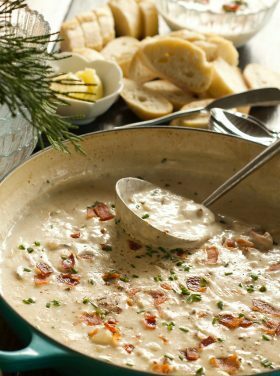 I have made it a lot of times at sea level (this is one of my favorite go to’s) but I just moved to CO.
Visit Mountain Mama Cooks blog … she has great tips for doing this, Carlyn! What a wonderful banana bread recipe. So moist! Every time I bake this, and I’ve baked it at least twenty times, I’m amazed at how good it is. Other banana bread recipes I tried (usually in the cinnamony-allspicey range) weren’t appreciated by my kids, but they just love this. Sour cream and vanilla work together perfectly! 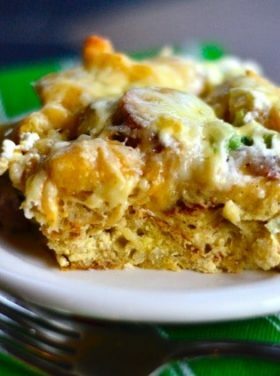 I usually add some cream cheese and even a spoonful of coconut flour and it’s so versatile. Thanks! This looks awesome – I can’t wait to try baking it! Just made this delicious banana bread and I’m throwing out my other recipe! Must be the sour cream addition—sooo good! Thank you! It’s our VERY favorite, too! Thanks April, our fave, too! We loved this. Thanks for the great recipe! How many calories is it per loaf?? This is so delicious! My kids were all fighting over the last piece and begging me to make another loaf! Well done! 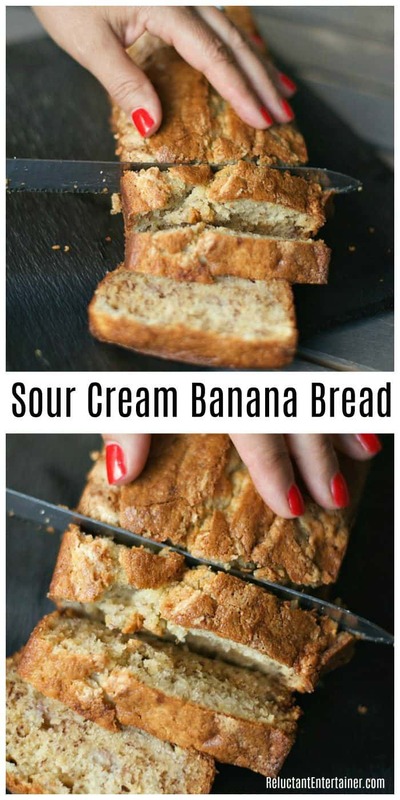 Sour cream in banana bread! I never thought of that but I already know it’s good! Banana bread is one of my many weaknesses. I love the addition of sour cream, makes it so moist and delicious. 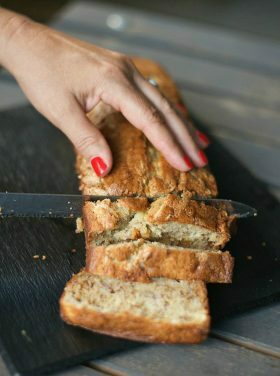 I love this take on banana bread! I am sure the sour cream makes it super moist and delish! This is the same recipe that I got from an old Junior League cookbook over 20 years ago. It’s been my go-to recipe for a long time. I usually cut the sugar amount a little and sometimes add some shredded coconut. 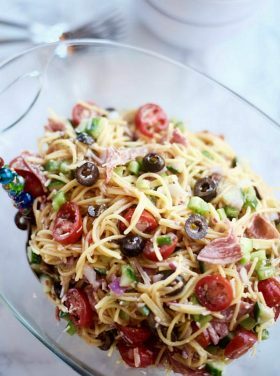 It is always a hit with my husband, kids and friends! 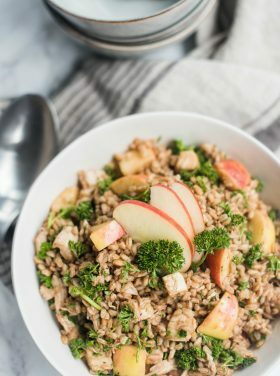 Great idea to add coconut! YUM! I used 3/4 cup unfiltered honey in place of the 1 Cup granulated sugar and I used King Arthur’s bread flour instead of AP flour. It took about 60 minutes (I live at high altitude). Something else I did has more to do with the way I prepared the bananas. I had ripe bananas. But not mushy bananas. I put them in the oven at 350 degrees for 25 minutes. The bananas were not only soft, there was a lot more natural water/juice, that really added to the flavor, texture and the moisture content in the final product. Great recipe. This is baking in my oven right now! Smells amazing! I didn’t have the full amount of sour cream so I substituted with some whole milk Greek yogurt. We’ll see how it turns out! I’ve been making this exact recipe with Greek yogurt for years. Love it! I made this last week. I used 2 cups flour plus 1/2 brown sugar & 1/2 white sugar. I figured if I did not use 2 cups of flour I would end up with it too wet in the middle. I sprinkled the top with Turbinado sugar plus buttered & sugared the loaf pan. I had to bake it for 70 mins til the center was done with toothpick test. I tented it with foil after 1 hr. I doubled the recipe thinking I would get at least 4 small loaves. I still only got 3. Not sure this recipe is correct???? My family really loves banana bread. I used my mother-in-law’s recipe for years, but I always felt like it could be better. I began trying out different recipes I found online, but I will NEVER try another recipe, because this is IT! I followed the recipe almost exactly (I just added some cinnamon because I love cinnamon in my banana bread) and made it as muffins. With my banana bread loving sons, the muffins didn’t last 24 hours! Making another batch today. 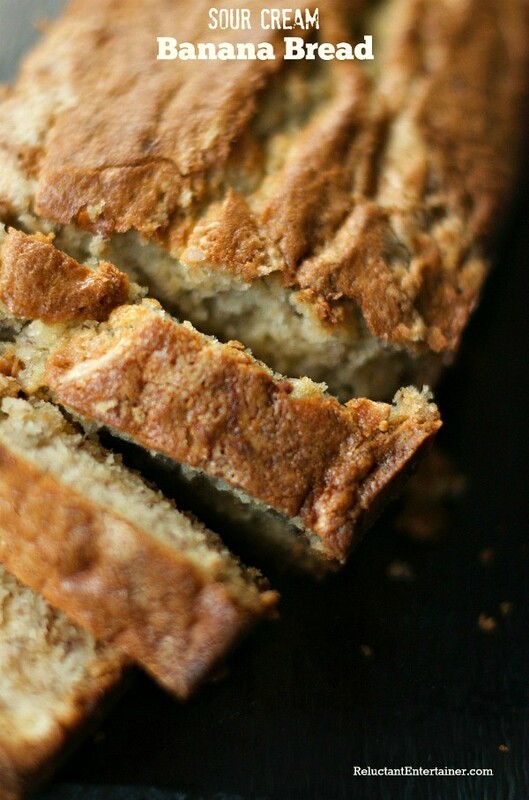 This is by far my favorite banana bread recipe! Glad you enjoyed it, Lynette! It’s our favorite, too! This has my name written ALL over it! I’ve made this so many times- SO GOOD. I’m sure I commented on the original post, but Yum! Now I want to make banana bread. The weather is a little cool this weekend, I have some bananas in the freezer, and sour cream in the fridge. I have a recipe from my mom for sour cream banana bread. I love making it because of course it reminds me of her. I followed the recipe exactly. So far my bread has been in the oven for 65 minutes and is almost getting too dark on the edges and is soup in the middle. I have a thermometer in my oven and it reads 350 degrees. Not sure what’s up with the recipe but a few more tips would be welcome. Also, would using a glass loaf pan have been better?